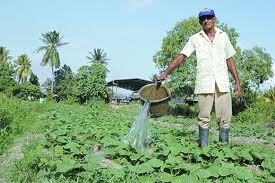 Over 200 hundred farmers in Golden Grove have received agricultural land of their own. Food Production Minister, Devant Maharaj says this gives farmers an opportunity to contribute to Food Security. According to the Minister, farmers play a vital role in helping to build a more food secure nation. 228 Golden Grove farmers were given parcels of land during a Land Allocation Ceremony at the Andre Kamperveen Hall in the Centre of Excellence, Macoya on Wednesday.